in April 17, 2014 fainted and collapsed on the dock when Deputy Minister Eran Wickramaratne began to give evidence. The case famously dubbed as the “Toy Pistol Case” against five suspects including the former Hambantota Mayor which came up for hearing before Hambantota High Court Judge Thamara Tennakoon yesterday had to be postponed till May 15 after the first accused in the case fainted and collapsed. In this case former Hambantota Mayor Eraj Raveendra, Premasiri Parnamana, Tuan Ramzan, Madusha Nilan and Bindu Sri Warnasinghe are charged on 29 counts for attacking on a team from Colombo including UNP Parliamentarian’s Ajith P Perera, Ajith Mannapperuma, Nalin Bandara, Eran Wickremaratne and R. Yogarajan.They were on an inspection tour of the South and as they were leaving the Hambantota Port Complex stones and eggs were hurled at them on April 17, 2014. The case was to be heard on a daily basis on March 26 and 27 with the agreement of both parties involved in the case. Accordingly State Minister Ajith P. Perera and R Yogarajan gave evidence on Monday 26. When hearing began yesterday State Minister Eran Wickramaratne began giving evidence,the first accused who was in the dock collapsed in the dock and hearing was postponed for 30 minutes. When hearing began around 1 pm. Defence Counsel Thusitha Aluthpatabendige informed court that the first accused Premasiri Paranamana was ill and receiving indoor treatment at the Hambantota hospital after being admitted there.The High Court Judge inquired about it from the Court Sergeant who confirmed that Paranamana was hospitalised after checking with the Hospital Police Post. Thereafter Deputy Solicitor General Dileepa Pieris who appeared for the petitioners requested the High Court Judge to issue order to submit a medical report about the condition of the first accused on the next date of hearing. The High Court Judge who ordered the Hambantota Hospital JMO to submit a medical report on the first accused, postponed hearing for May 15. The High Court Judge also ordered Minister Eran Wickramaratne, Ajith Mannaperuma and Nalin Bandara to appear in Court to give evidence on the next date. A team of Attorneys led by U. R. de Silva and Thusitha Aluthpatabendige appeared for the accused in this case while Deputy Solicitor General Dileepa Pieris and State Counsel Jehan Gunasekera appeared for the petitioners. A group of then opposition UNP MPs in 2014 during President Rajapaksa’s rule came under attack from goons when they were on a fact finding visit to the new airport and port in Hambantota. 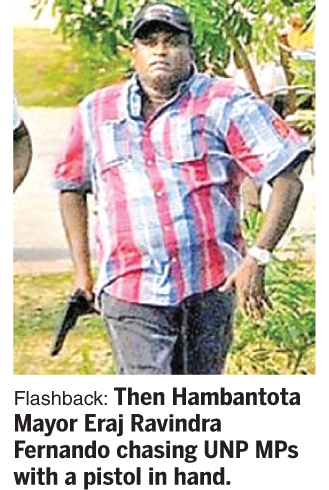 Subsequently, photographs showed the Mayor of Hambantota, Eraj Ravindra Fernando chasing the UNP MPs with a pistol in his hand, closely followed by members of the goon squad. Subsequently the mayor claimed that he was only acting to protect the MPs and that too with a toy pistol.